The Avengers Infinity War Tony Stark Pants are the most underrated outerwear from the movie. But those moviegoers who spotted and wished for owning one of the famous casual wears of Tony Stark can finally find it possible. Here is the Avengers Infinity War Tony Stark Pants. Cotton is used for the Avengers Infinity War Robert Downey Jr Camouflage Cotton Pants. 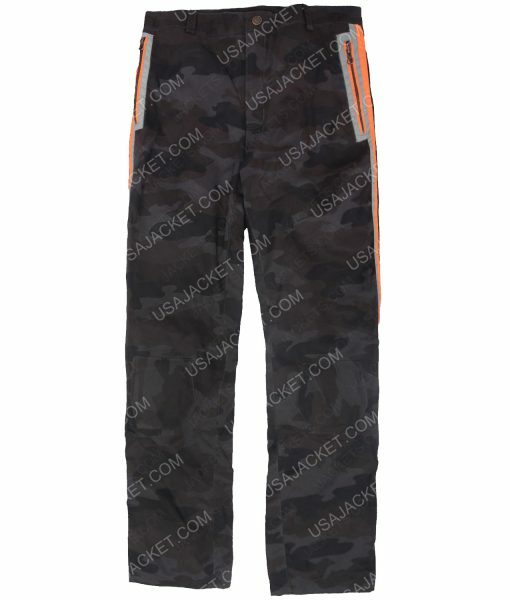 This has the camouflage prints all over the black colored trousers. It has a button closure with a zipper fly fastening. We have used YKK zippers, the best and durable branded zips for the closing and the pockets on the side. It also has two pockets on the back with orange detailing on the borders.